5. Um diese Texte, die ursprünglich richtig von Mir sind, zu verstehen und sie als Meine Lehre zu würdigen, muss man zuerst wissen, bei welcher Gelegenheit Ich sie ausgesprochen habe und wie infolge einer richtigen Übersetzung. 9. 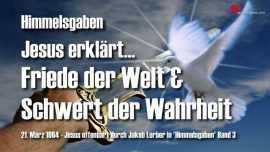 Da fragte freilich das Häuflein Pharisäer und Schriftgelehrte, wie Ich es wagen könne, sie für Kinder des Satans, aller Teufel und ihrer eigenen Blindheit, Trägheit und Bosheit zu erklären, indem sie erwiesenermassen alle aus dem Stamme Levi abstammten! 12. Wer aus euch allen, so er nur einen Funken Glauben an Mich und Meine Lehre besitzt, kann es Mir zumuten, dass Ich heute auf das heiligste allen Menschen ans Herz legte, Gott über alles zu lieben und zu erkennen und seinen Nächsten wie sich selbst, und morgen mit einem andern Gebote käme und sagte: Hasset und verfolget euch gegenseitig nach Möglichkeit mit dem Schwerte in der Hand. – Ich meine, dass man solch einen Lehrer aus dem Reiche der Barbaren offenbar in eine starke Sicherheitsanstalt zu bringen genötigt finden müsste, da so ein Lehrer doch offenbar ins Tollhaus gehörte. 13. Und da Ich euch noch diese Texte im rechten und wahren Geiste erklärt habe, so werdet ihr doch einsehen, dass Ich dadurch nicht im geringsten Meiner göttlichen Weisheit widerstrebt habe und somit auch kein Tollhäusler bin, als was Mich schon so manche Schriftsteller der neuen Zeit erklärt haben, was Mich aber dennoch mit keinem Grimme wider sie erfüllt, sondern Ich vergebe es ihnen, weil sie wirklich nicht wissen, was sie tun. Und somit über diese fraglichen Verse gut für jetzt. Amen. 5. To understand and honor these texts as My Teachings, which originally really came from Me, one has to first know, at which opportunity I uttered them and how, with a proper translation that is. 9. Then, the small group of pharisees and scribes asked, how I would dare to declare them to be children of satan, of all the devils and of their own blindness, lethargy and malice, since all of them evidentially stemmed from the tribe of Levi! 11. Knowing this, it becomes evident to everyone, especially to those proficient and adept in the Hebrew Scriptures, that I uttered these 3 verses in the 10th chapter only during this occasion, which I have just mentioned to you, and which were written down by the pseudo evangelist Matthew, or better by the already introduced l’Rabbas in Sidon, and literally in the exact same way I just disclosed it to you again. For those verses of the translation from the evangelist, which you highlighted as completely contradictory to My spirit, would obviously completely knock out My main teaching of brotherly love, as well as the law of Moses. 12. Who among you, if he possesses only a spark of faith in Me and My teaching, could expect of Me, that I would today lay into the heart of all people, to love and recognize God above all else, and to love his brother as he loves himself, and then tomorrow I’d come with a completely different commandment and say… Hate and persecute each other, if possible with the sword in your hand. – I mean, it is obvious, that such a teacher from the land of barbarians should certainly be brought into a mental institution, since such a teacher would obviously belong into a madhouse. 13. And now that I have explained these texts to you in the proper and true spirit, you will surely realize, that by that I did not in the least contradict My Divine Wisdom, and therefore, I am also no maniac, as which many writers of the new era have declared Me to be. This however does not fill Me with any fury, instead, I forgive them, because they truly do not know what they are doing. And thus, enough for now about these questionable verses. Amen. 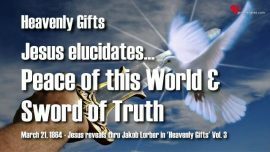 This entry was posted in Himmelsgaben Jakob Lorber Gifts of Heaven and tagged Matthäus 10:34-36, Matthew 10:34-36, Schwert der Wahrheit, Sword of Truth by jcadmin. Bookmark the permalink.